Aims Deregulated chromatin remodelling often leads to aberrant gene expression in cells, thereby implicating tumour development and progression. As a subunit of remodelling and spacing factor complex, Rsf-1 (HBXAP), a novel nuclear protein with histone chaperon function, mediates ATPase-dependent chromatin remodelling and confers tumour aggressiveness in common carcinomas. However, the expression of Rsf-1 has never been reported in nasopharyngeal carcinoma (NPC). This study aimed at evaluating the expression status, associations with clincopathological variables and prognostic implications of Rsf-1 in a well-defined cohort of NPC. Methods Rsf-1 immunoexpression was retrospectively assessed in biopsies of 108 consecutive NPC patients without initial distant metastasis and treated with consistent guidelines. The results were correlated with the clinicopathological features, therapeutic response, local recurrence-free survival (LRFS), distant metastasis-free survival (DMFS) and disease-specific survival (DSS). Results Present in 49 cases (45%), Rsf-1 overexpression was associated with N2,3 status (p=0.016), American Joint Committee on Cancer stage 3, 4 (p=0.004), and incomplete therapeutic response (p=0.041). In multivariate analyses, Rsf-1 overexpression not only emerged as the sole independent adverse prognosticator for LRFS (p=0.0002, RR 5.287) but also independently predicted worse DMFS (p=0.0011, RR 3.185) and DSS (p<0.0001, RR 4.442), along with T3,4 (p=0.0454) and N2,3 (p=0.0319), respectively. Conclusion Rsf-1 overexpression is common and is associated with adverse prognosticators and therapeutic response, which confers tumour aggressiveness through chromatin remodelling, and represents a potential prognostic biomarker in NPC. Nasopharyngeal carcinoma (NPC) is an endemic head and neck epithelial malignancy in southeast Asia and southern China.1 2 In Taiwan, the incidence of NPC is eight to 10 per 100 000 person-years, similar to that of Singapore (database from Bureau of Health Promotion, Taiwan).3 NPC is strongly linked with Epstein–Barr virus, especially in the subtypes of differentiated and undifferentiated non-keratinising carcinoma.1 2 4 Apart from Epstein–Barr virus infection required for tumour initiation, several lines of evidence indicate that genetic susceptibility and environmental factors may also contribute to deregulation of multiple oncogenes and tumour suppressor genes that induce progression from pre-neoplastic lesions to frank malignancies.1 5 The advances in diagnostic imaging, radiation therapy and adjuvant chemotherapy of NPC have achieved better locoregional control.1 6 However, the current challenge of the management of patients with NPC appears less satisfactory in final treatment outcomes.1 6 Despite being an important parameter, tumour–node–metastasis (TNM) staging still has room for improvement in terms of providing the optimal prognostication to patients. In this context, it is desirable to identify an effective biomarker that better correlates with tumour growth and/or treatment outcomes in patients with NPC, so as to aid in risk stratification and perhaps the development of therapeutic targets. Tissue sections were cut from paraffin-embedded blocks at 3-μm thickness. Slides were deparaffinised with xylene, rehydrated with ethanol, heated by microwave treatment in a 10 mM citrate buffer (pH 6) for 7 min. Endogenous peroxidase was quenched by 3% hydrogen peroxide treatment. Slides were washed with Tris buffered saline for 15 min and then incubated with a primary monoclonal antibody targeting Rsf-1 (1:2000; Upstate, 5H2/E4, Lake Placid, New York, USA) for 1 h, the specificity of which has previously been reported.10 Primary antibodies were detected using the ChemMate EnVision kit (DAKO, K5001, Carpinteria, California, USA). The slides were incubated with the secondary antibody for 30 min, developed with 3,3-diaminobenzidine for 5 min, and then counterstained with Gill's haematoxylin. An ovarian high-grade serous adenocarcinoma known to express RSf-1 was used as a positive control. Rabbit serum IgG was used to replace primary antibody as a negative control. Rsf-1 immunoexpression was scored by two pathologists (HCT and HYH) using a multiheaded microscope to reach a consensus for each case without knowledge of clinical and follow-up information. The percentage of tumour cells with Rsf-1 immunoexpression was recorded for each NPC specimen and classified into five groups of various expression levels from 0 to 4+, denoting none, 1∼24%, 25∼49%, 50∼74% and 75∼100% of tumour cells with moderate to strong nuclear reactivity, respectively. For statistical analysis, Rsf-1 overexpression was defined as cases featuring 3+ or 4+ immunoreactivity. All 108 patients were regularly monitored after radiotherapy until death or their last appointment, with the mean follow-up duration being 64.3 months (range 4–117). Nevertheless, treated in the earlier phase of this cohort, seven patients were not available to obtain instantaneous image studies after therapy as the baseline for treatment response evaluation. Another 101 patients received a complete course of radiotherapy (total dose ≧7000 cGy) and also cisplatin-based chemotherapy in the case of stage II–IV disease, based on the published protocol.15 There were 94 complete and seven partial responders according to the methodology reported by Lin et al,16 who adopted WHO criteria with elaborations of clinical examinations and imaging modalities to assess treatment response. Statistical analyses were performed using SPSS V.14 software package. The comparisons of Rsf-1 expression status between the subgroups of various clincopathological parameters were evaluated by χ2 or Fisher's exact test. The endpoints analysed were local recurrence-free survival (LRFS), distant metastasis-free survival (DMFS) and disease-specific survival (DSS), calculated from the starting date of radiotherapy to the date of the event. Patients lost to follow-up were censored on the latest follow-up date. Survival curves were plotted using the Kaplan–Meier method, and log-rank tests were performed to evaluate prognostic differences between groups. Multivariate analysis was performed using the Cox proportional hazards model. For all analyses, two-sided tests of significance were used with p<0.05 considered significant. As shown in the table 1, these 108 cases of NPC consisted of five keratinising squamous cell carcinoma (figure 1A), 47 non-keratinising differentiated carcinomas and 56 non-keratinising, undifferentiated carcinomas (figure 1B). There were 82 men and 26 women with a mean age of 48 years (range 20–77). Seven cases were classified as stage I, 18 as stage II, 52 as stage III and 31 as stage IV. Rsf-1 immunoexpression was seen and successfully scored in all 108 cases, with a wide range of positively stained tumorous nuclei, varying from 10% to 90% (median 45%). Fifty-nine cases showed 1∼2+ (<50%, figure 1C) staining, while 49 cases were 3∼4+ and therefore classified as the Rsf-1-overexpressing group (figure 1D). Rsf-1 overexpression was present in 49 (45.4%) of 108 cases and was significantly associated with NPC cases featuring N2,3 status (p=0.016), AJCC stage 3, 4 (p=0.004) and incomplete therapeutic response (p=0.041) (table 2). However, there was no association between Rsf-1 expression and other clinicopathological factors. 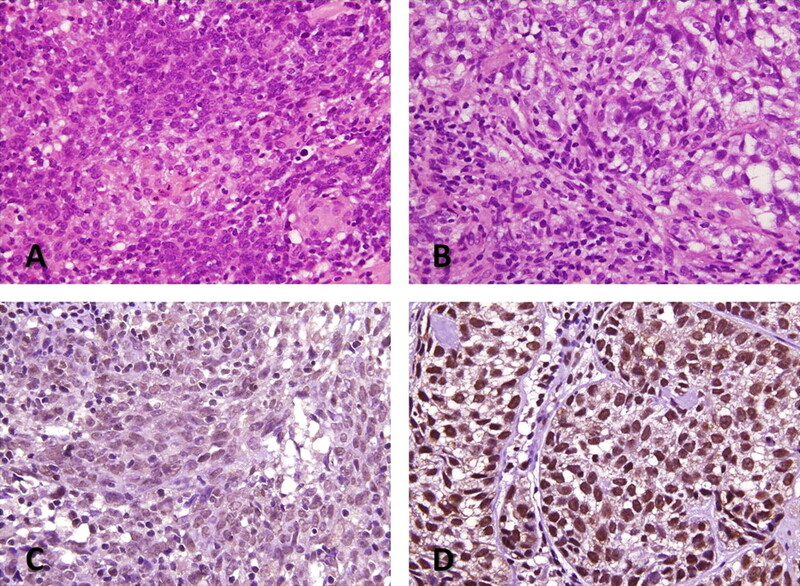 Photomicrographs of one each representative keratising (A) and non-keratinising undifferentiated (B) nasopharyngeal carcinoma. Rsf-1 immunohistochemistry in representative nasopharyngeal carcinoma cases that showed a varying extent of nuclear labelling interpreted as low (C) and overexpression (D), respectively. As shown in table 3, patients with NPC more frequently presented with N2,3 status (p=0.0019), AJCC stage 3, 4 (p=0.0211) and only partial response to radiotherapy. 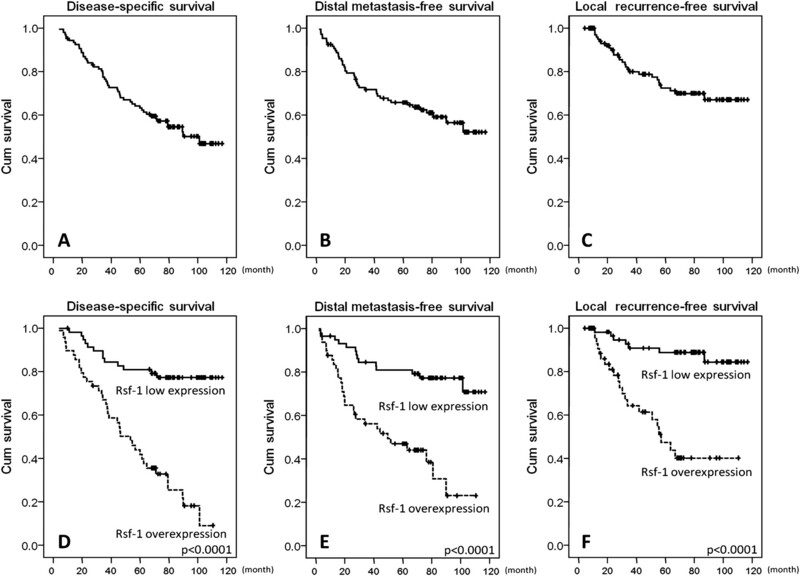 The median durations to the development of local recurrence and distal metastasis were 66 and 70 months, respectively (figure 2A–C). Rsf-1 overexpression (p<0.0001) correlated with a more aggressive clinical course, with a significantly shorter DSS in patients with NPC (figure 2D). In addition, it was also strongly predictive of poor outcomes for DMFS (figure 2E) and LRFS (figure 2F) (p<0.0001 for both), together with N2,3 status (p=0.0369 for DMFS; p=0.0212 for LRFS). Other univariately significant prognosticators included T3,4 status (p=0.0054) and AJCC stage 3, 4 (p=0.0112) for worse DMFS and LRFS, respectively. In multivariate analysis, Rsf-1 overexpression still remained as the most powerful prognosticator for all three endpoints evaluated, and independently portended inferior LRFS (p=0.0002, HR 5.287) alone, worse DSS (p<0.0001, HR 4.442) along with N2,3 status (p=0.0454) and inferior DMFS (p=0.0011, HR 3.185) together with T3,4 status (p=0.0319) (table 4). For the entire cohort, survival curves were shown for various endpoints (A–C). In addition, disease-specific survival (D), distant-metastasis-free survival (E) and local recurrence-free survival (F) were plotted using the Kaplan–Meier method according to Rsf-1 immunoexpression. For the first time, the expression status of Rsf-1 immunostaining in NPC was documented in our study. Present in 45% of cases, Rsf-1 protein overexpression was found to be significantly associated with more advanced nodal status, AJCC stages, and incomplete therapeutic response, indicating its potential role in promoting tumour progression, aggressiveness and resistance to radiotherapy of NPC. Despite not being entirely relevant, Rsf-1 overexpression may change the expression status of several genes and activate certain signalling pathways, contributing to paclitaxel resistance in ovarian cancer.7 With respect to all three survival endpoints, Rsf-1 ovexpression was further identified as an independent adverse prognosticator of NPC in addition to the TNM staging system. These findings were essentially in keeping with what was previously reported in ovarian high-grade serous carcinomas, clear cell carcinoma and head and neck squamous cell carcinomas,8 10 25 26 suggesting the potential utility of Rsf-1 immunostaining as a prognostic biomarker of NPC. However, Rsf-1 gene amplification does not entirely account for human carcinomas with Rsf-1 protein overexpression, as reported in ovarian clear cell carcinomas.25 Given that 11q13 gain was frequent in NPC,9 it is conceivable to explore further whether RSF-1 amplification was indeed present in NPC with Rsf-1 immunohistochemical overexpression and aggressive behaviour. In conclusion, Rsf-1 overexpression is present in 45% of NPC cases and significantly correlates with incomplete response to radiotherapy and more advanced nodal status and AJCC stages. Our data suggest that Rsf-1 overexpression may contribute to disease progression in NPC, which warrants further elucidation of the molecular mechanisms underlying its protein expression. More importantly, Rsf-1 overexpression is an independent adverse prognosticator of patient survival in this study, justifying prospective prognostic analysis in a future large-scale study. The chromatin structure is highly dynamic and its conformation is reorganised by chromatin remodelling factors when genes are activated or repressed. Deregulated chromatin remodelling may perturb the regulation of gene expression in tumour cells, thereby implicating tumour development and progression. Compared with improved locoregional control, the current challenge of management of patients with NPC appears less satisfactory in final treatment outcomes, necessitating the identification of an effective prognostic marker to facilitate appropriate allocation of adjuvant therapy. RSF1 encodes the chromatin-remodelling nuclear protein to mediate ATPase-dependent chromatin remodelling and is known to be a driver-amplified oncogene in common carcinomas. In NPC, Rsf-1 overexpression is present in a substantial proportion of cases and significantly correlates with incomplete response to radiotherapy and more advanced nodal status and AJCC stages. Moreover, RSF-1 overexpression represents an independent adverse prognosticator of patient survival.
. Advances in nasopharyngeal carcinoma. Curr Opin Oncol 2008;20:264–9.
. Epidemiology of nasopharyngeal carcinoma. Semin Cancer Biol 2002;12:421–9.
. Nasopharyngeal carcinoma. In: Barnes L, Eveson JW, Reichart P, et al., eds. World Health Organization Classification of Tumors—Pathology & Genetics: Head and Neck Tumors. Lyon: IARC Press, 2005:85–97.
. Genetic and epigenetic changes in nasopharyngeal carcinoma. Semin Cancer Biol 2002;12:451–62.
. Treatment results for nasopharyngeal carcinoma in the modern era: the Hong Kong experience. Int J Radiat Oncol Biol Phys 2005;61:1107–16.
. Amplification of a chromatin remodeling gene, Rsf-1/HBXAP, in ovarian carcinoma. Proc Natl Acad Sci U S A 2005;102:14004–9. , eds. AJCC Cancer Staging Manual, 7th edn. New York: Springer, 2010.
. Accelerated concomitant boost radiotherapy and chemotherapy for advanced nasopharyngeal carcinoma. J Clin Oncol 2001;19:1105–10.
. Phase III study of concurrent chemoradiotherapy versus radiotherapy alone for advanced nasopharyngeal carcinoma: positive effect on overall and progression-free survival. J Clin Oncol 2003;21:631–7.
. High resolution allelotype of microdissected primary nasopharyngeal carcinoma. Cancer Res 2000;60:3348–53.
. Chromatin remodeling and cancer. Part II: ATP-dependent chromatin remodeling. Trends Mol Med 2007;13:373–80.
. Ordered recruitment of transcription and chromatin remodeling factors to a cell cycle- and developmentally regulated promoter. Cell 1999;97:299–311.
. The SWI/SNF complex and cancer. Oncogene 2009;28:1653–68.
. The SWI/SNF complex – chromatin and cancer. Nat Rev Cancer 2004;4:133–42.
. The roles of human sucrose nonfermenting protein 2 homologue in the tumour-promoting functions of Rsf-1. Cancer Res 2008;68:4050–7.
. Rsf-1 (HBXAP) expression is associated with advanced stage and lymph node metastasis in ovarian clear cell carcinoma. Int J Gynecol Pathol 2011;30:30–5.
. Expression of Rsf-1, a chromatin-remodeling gene, in ovarian and breast carcinoma. Hum Pathol 2006;37:1169–75. HCT and HYH contributed equally to this work. Funding This work was supported in part by grants from Chi-Mei Medical Center (99-CM-TMU-03) and Department of Health, Taiwan (DOH99-TD-C-111-004). Ethics approval Ethics approval was provided by the institutional review board, who had approved the procurement of formalin-fixed tissue and further immunohistochemical study of nasopharyngeal carcinoma for this paper (IRB100-09-003).